A Peptic Ulcer is a sore in the lining of the stomach or the first part of the small intestine. An ulcer is caused by an imbalance between the acids and enzymes that break down food in the upper gastrointestinal tract. The imbalance of digestive fluids leads to inflammation, deterioration of the protective mucus lining, and ulcer formation. A Gastric Ulcer refers to an ulcer that is located in the stomach. 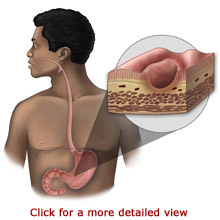 A Duodenal Ulcer is located in the first section of the small intestine. Some ulcers may not cause symptoms. Others may cause pain and bleeding. Ulcers are rarely life threatening. Treatments for ulcers include lifestyle changes, medications, and surgery. Your stomach produces acids to break down food for digestion. Your stomach secretes mucus to protect its lining from the acids. Your stomach processes the food you eat into a liquid form. The processed liquid travels from your stomach to your small intestine. Your small intestine breaks down the liquid even further so that your body can absorb the nutrients from the food you ate. Your small intestine also has protection from irritating digestive acids. The remaining waste products from the small intestine travel to the large intestine. Peptic Ulcer Disease is caused by an imbalance between acid and pepsin enzyme in the stomach and duodenum. The imbalance of digestive fluids causes inflammation, breakdown of the protective mucus lining, and leads to ulcer formation. A Gastric Ulcer is located in the stomach. A Duodenal Ulcer is located in the duodenum. Most ulcers occur in the first layer of the stomach or intestinal lining. Some ulcers can penetrate through the intestine, creating a hole. This condition is called a Perforated Ulcer or Perforation of the Intestinal Lining. Peptic Ulcer Disease occurs for several reasons. A bacterial infection from Helicobacter pylori (H. pylori) can cause ulcers. They can be caused by the use of non-steroidal anti-inflammatory medications (NSAIDS) including aspirin, ibuprofen, naproxen, and other prescription medications. Tumors produced by Zollinger-Ellison Syndrome can increase acid output and cause ulcers. People that breathe with a mechanical respirator have a risk for ulcers. Additionally, smoking, consuming alcohol, chronic gastritis, and increasing age contribute to ulcer formation. Some ulcers may cause no symptoms at all. Symptoms can differ from person to person. You may experience a gnawing or burning pain in your stomach or upper abdomen. The pain may occur more frequently between meals or at night. The pain may even waken you at night. Your pain may get better or worse after eating a meal. Ulcers can cause nausea, bloating, and heartburn. In severe cases, you may vomit blood or have blood in your stools from intestinal bleeding. Your stools may appear very dark or black if they contain blood. You may lose weight and feel tired all of the time. Your doctor can diagnose peptic ulcer disease after reviewing your medical history and by conducting a physical examination. You should tell your doctor about your symptoms and risk factors. Your doctor may order blood tests, stool tests, and a test for H. pylori bacteria. Your doctor may also order tests, including a Barium Swallow or an Upper Gastrointestinal Intestinal (GI) Endoscopy, to help confirm the diagnosis. An Upper Gastrointestinal (GI) Series or Barium Swallow provides a set of X-rays showing the esophagus, stomach, and small intestine. Before the X-rays are taken, barium, a chalky substance, is swallowed. The barium provides a picture of the upper gastrointestinal structures on the X-ray images. A barium swallow is commonly used to determine the cause of pain, swallowing problems, blood stained vomit, and unexplained weight loss. A barium swallow is an outpatient procedure that does not require sedation or anesthesia. An Upper Gastrointestinal Intestinal (GI) Endoscopy is a procedure that uses an endoscope to view the esophagus, stomach, and upper duodenum, the first part of the small intestine. This test is also called an esophagogastroduodenoscopy (EGD) or a gastroscopy. An endoscope is a long thin tube with a light and a viewing instrument that sends images to monitor. The endoscope allows a doctor to examine the inside of the upper gastrointestinal tract for ulcers, bleeding, tumors, polyps, diseases, and other abnormal conditions. A tissue sample or biopsy can be taken with the endoscope. This is frequently done to test for H. pylori bacteria. An endoscope is also used to treat bleeding. An upper GI endoscopy is an outpatient procedure. You will receive medication to relax you prior to the test. Some ulcers may go away without formal treatment. Other ulcers can be corrected with lifestyle changes aimed at eliminating the cause of the ulcer. Such lifestyle changes include avoiding alcohol, cigarette smoking, caffeine products, aspirin, and NSAIDs. It can be helpful to eat several small meals throughout the day. Your doctor may prescribe medication to treat your ulcer. Medication types include antibiotics, acid blockers, proton pump inhibitors, and tissue lining protectors. Most ulcers heal with medication in about eight weeks. An Upper GI Endoscopy may be used to stop bleeding from ulcers. Perforated ulcers or severe bleeding may require surgery. A partial gastrectomy is a surgery that removes part of the stomach. A vagotomy is a surgery to cut the vagus nerve, the nerve that controls stomach acid production. Ulcer recurrence is common. You can help prevent ulcers or recurrence by correcting the risk factors that you have control over. This includes avoiding aspirin, NSAIDs, smoking, and alcohol. If you experience the symptoms of an ulcer, call your doctor for prompt treatment. Risk factors may increase your likelihood of developing ulcers. People with all of the risk factors may never develop the condition; however, the chance of developing an ulcer increases with the more risk factors you have. You should tell your doctor about your risk factors and discuss your concerns. _____ The use of aspirin and NSAIDs can cause ulcers. _____ H. pylori bacterial infections can cause ulcers. _____ Chronic gastritis can contribute to ulcer formation. _____ Smoking cigarettes and using tobacco increase the likelihood of developing an ulcer. _____ Excessive consumption of alcohol increases the risk of ulcer. _____ The risk of ulcer development increases with age, especially after 50 years old. _____ People with Zollinger-Ellison Syndrome may have excess acid from gastrinomas (tumors). _____ People that use a mechanical ventilator to breathe have an increased risk of ulcer formation. _____ A family history of ulcers is associated with an increased risk of developing ulcers. _____ People with Type O blood have an increased risk for ulcer formation. _____ People with liver, kidney, or lung disease are at risk for developing ulcers. Research indicates that stress from home or work does not cause or worsen ulcers. Complications are more likely to occur in people that do not seek treatment or follow their treatment plan. Serious complications from ulcers include internal bleeding, perforation, and bowel obstruction. Ulcers can be but are rarely life threatening. You should call Emergency Services in your area if you experience sharp abdominal pain, fainting, excessive sweating, or confusion. You should also call Emergency Services if you vomit blood or have blood in your stools or if your abdomen is hard and tender to touch. Call your doctor if you experience dizziness, lightheadedness, or ulcer symptoms.